Amador Barn Owl Box Co. The Amador Raptor Roost Kit (Hunting Perch Kit ) was developed in response to many inquiries related to the menace of Ground Squirrel presence. Unlike ‘Nesting Boxes,’ the Raptor Roost is a hunting perch for hawks, falcons, eagles, kestrels, and other birds of prey. It provides a tactical viewing platform that increases the raptors’ ability to spot and capture field prey. Perches also help sustain and build raptor species populations. The Amador Raptor Roost Kit is designed so that it may be mounted on a wooden or metal pole (recommended). 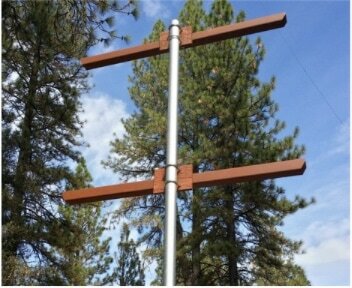 Recommended best is to use a 21' galvanized schedule 40 thickness steel pole, hardware is included for this. As with all Amador Barn Owl Box Company products, the Raptor Roost is made in the USA of domestically sourced materials, by local Amador County craftsmen.